It’s rare for directors to remake their own films. Michael Haneke remade his 1997 film Funny Games in 2007. Yasujiro Ozu’s 1934 film A Story of Floating Weeds became Floating Weeds in 1959. Alfred Hitchcock decided to redo his 1934 film The Man Who Knew Too Much in 1956 (Check out my previous column on the earlier film). He cast James Stewart (in their third film together out of four) and singer/actress Doris Day in the lead roles. The film was scripted by John Michael Hates, with music by Bernard Herrmann, and cinematography by Robert Burks. How does this Hollywood film compare to its British original? Dr. Ben McKenna (Stewart) is on holiday in Morocco with his wife, the famous singer Jo Conway (Day), and their son Hank (Christopher Olsen). They meet Louis Bernard (Daniel Gelin), a mysterious Frenchman, as well as Lucy and Edward Drayton (Brenda di Banzie, Bernard Miles). In a marketplace, the McKennas witness Louis’s murder, and he gives Ben cryptic clues. Hank is kidnapped, seemingly by the Draytons. Ben and Jo travel to London following Louis’s clues so they can reunite with their son. Soon they get tangled up in an assassination plot. In the writing phase, Hitchcock instructed Hayes not to watch the 1934 film or read its screenplay. 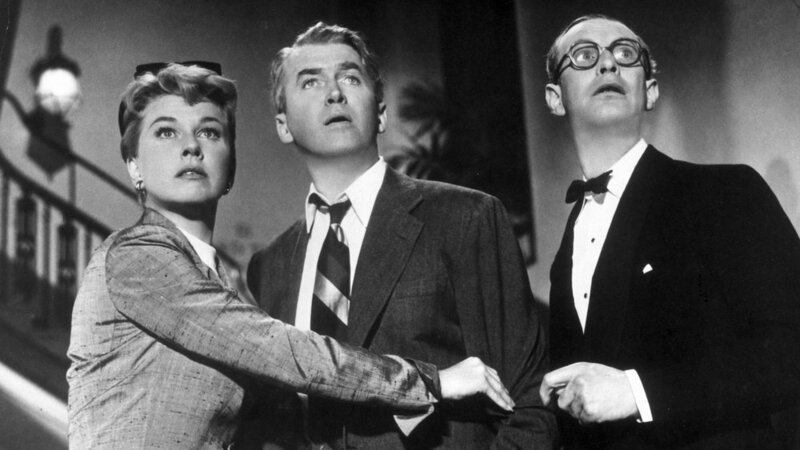 Hitchcock only narrated the basic plot and wanted Hayes to come up with a new story. While this new film does have shades of the previous one, it’s definitely its own film. Much like Hitchcock’s Rear Window, the mystery isn’t the real meat of the film. It’s the relationships between the three family members. The marriage is more complicated; the outward veneer of domestic harmony reveals inner conflict. It’s not that the McKennas are an unhappy bunch, but Hitchcock and Hayes pepper in tidbits of more tension in the family. Ben often condescends to Jo, possibly acting out because she had her own career and is recognized for it. In one scene, he gives her sedatives as she becomes hysterical, but it isn’t presented as the right thing to do. Hitchcock recreates the famous Royal Albert Hall sequence as a 12-minute, silent set piece. Hitchcock gave Herrmann the option to create new music for the scene or reuse Arthur Benjamin’s Storm Clouds Cantata from the 1934 film. Herrmann, who cameos as the conductor, chose the latter. What really stood out to me in this film is the theme of voices, specifically women’s voices, as what can stop evil and save the day. Jo’s well-timed scream averts the assassination plot, and ultimately it’s her singing that brings Hank back to her and Ben from the captors. Her screams and cries upon losing her son reflect a maternal despair and rage, one that is contrasted by Ben’s coolness. Mrs. Drayton also screams out when her co-conspirators suggest hurting Frank. Women speak out, sing or scream because they have to and it’s the right thing to do. The casting of James Stewart is a no-brainer. His everyman charm, sense of humor, and calm authority give way to a nervous, confused man. Doris Day at the time was primarily known as a singer. She had impressed Hitchcock with her role in Storm Waiting, which led to more dramatic roles. I really love Doris Day in this film. Not only is her singing just heart-stirring and stunning, but her performance is compelling, nuanced, and beautiful. Together, Doris Day and James Stewart create a believable, lived-in marriage with individualized characters who work well side by side. The big question: is the 1956 film better than the 1934 version? Personally, I prefer the Hollywood film. Robert Burks’ gorgeous cinematography, the lead performances, and the added element of international intrigue make this film more satisfying. I also find this concert set piece far more elegant and polished here. Hitchcock juxtaposing the vanilla McKennas with the Moroccan setting and murderous conspiracy wrings some laughs. I definitely missed a strong villain like Peter Lorre from the first film; the strength of this film lies on the marquee names. Both films are successful in their goals and I enjoy the 1934 film quite a bit. However, I find myself returning to the remake more often.